Due to the features of complete rich nutrition, good absorption, easy management, feed pellet has been becoming increasingly popular around the world in theses years, more and more farmers and animal owners choose the feed pellets for their animals and the animal feed production factory has started to produce feed pellet, which leads the development of feed pellet machine manufacturing industry, especially the mobile feed pellet line, getting a favorable reputation around the world. We have customers all over the world who have set up our portable feed pellet line for making nutritional animal feed pellets, such as, UK, Italy, America, Japan, Philippine, Vietnam, Brazil, Australia, Thailand, Stan countries, Africa etc. Mobile feed pellet line is also called portable feed pellet line, having a small production capacity, but it integrates crushing, mixing, pelleting, cooling, packing and conveying as a whole, having the specially designed machine in every process: hammer mill, cyclone separator, material storage bin, ZLSP-series feed pellet machine, water tank, vibrating screen, conveyor, foundation frame and electric cabinet. This hammer mill adopts changing positions of 15 hammer blades to crush the raw materials into 3-5 mm, which is the proper size requirement for feed pellet machine. It is used for transporting the crushed raw materials to the storage bin for storage and mixing. Connected to the vibrating screen which is equipped for cooling and screen the finished feed pellets, collecting the dust and fines for reproduction. In this storage bin, the crushed raw materials can be mixed fully, meanwhile the moisture content can be adjusted to the proper. Here is equipped a screw conveyor for transport the well-mixed raw materials into the feed pellet machine. This series feed pellet machine is the most suitable machine for making animal feed pellets, designed with the perfect compression ratio to press into feed pellets. 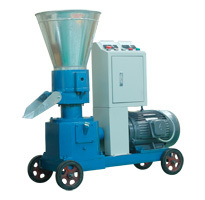 You can choose one type of feed pellet machine according to your actual situation. This pellet cooler used in mobile feed pellet line is the combined screen cooler. The cooler is capable of vibrating, cooling, and sieving the pellets to obtain high quality feed pellets. This conveyor adopts the scraper type, is easy for later packing and collecting the feed pellets through lifting the feed pellets to the high position. The electric cabinet is designed with compact structure, the function of dustproof. And the electric components adopt the high quality Schneider Electric brand, which is very convenient in the production. This mobile feed pellet line is designed with small size, compact structure, easy to move to anywhere you like, suitable for making feed pellet in farms, backyards and the place needing small production capacity. Wide applications. This portable feed pellet line can produce various of animal feeds like chicken, cattle, sheep, horse, pig, goat, deer, lamb, pigeon, goose, cat, rabbit etc. Wide raw materials. Various raw materials can be produced by this line, such as, corn, wheat, grasses, rice, maize, soybean, oil cake, cassava, pasture, alfalfa etc. 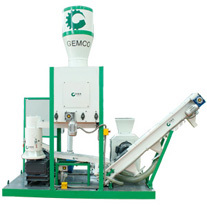 Equipped with high quality components in this mobile feed pellet line, it has long serving time. With low cost and high efficiency, portable feed pellet line is the preferred choice for the new beginner to invest.